All player communication commands, except the 'gsay' one. How many dice to roll for orcknuckle. Definition at line 90 of file c_chat.c. emotion emotion code, one of EMOTE_xxx. Definition at line 646 of file c_chat.c. References draw_ext_info(), draw_ext_info_format(), EMOTE_FIRST, EMOTE_LAST, ext_info_map_except(), ext_info_map_except2(), FIND_PLAYER_NO_HIDDEN_DM, find_player_options(), FIND_PLAYER_PARTIAL_NAME, obj::map, MAX_BUF, MSG_TYPE_COMMAND, MSG_TYPE_COMMAND_ERROR, MSG_TYPE_COMMUNICATION, MSG_TYPE_COMMUNICATION_EMOTE, obj::name, NDI_UNIQUE, NDI_WHITE, pl::ob, and snprintf. Referenced by command_accuse(), command_beg(), command_bleed(), command_blush(), command_bounce(), command_bow(), command_burp(), command_cackle(), command_chuckle(), command_clap(), command_cough(), command_cringe(), command_cry(), command_dance(), command_flip(), command_frown(), command_gasp(), command_giggle(), command_glare(), command_grin(), command_groan(), command_growl(), command_hiccup(), command_hug(), command_kiss(), command_laugh(), command_lick(), command_nod(), command_poke(), command_pout(), command_puke(), command_scream(), command_shake(), command_shiver(), command_shrug(), command_sigh(), command_slap(), command_smile(), command_smirk(), command_snap(), command_sneeze(), command_snicker(), command_sniff(), command_snore(), command_spit(), command_strut(), command_sulk(), command_thank(), command_think(), command_twiddle(), command_wave(), command_whistle(), command_wink(), and command_yawn(). Definition at line 908 of file c_chat.c. Definition at line 1271 of file c_chat.c. Definition at line 1282 of file c_chat.c. Definition at line 952 of file c_chat.c. Definition at line 754 of file c_chat.c. Definition at line 930 of file c_chat.c. Definition at line 963 of file c_chat.c. Definition at line 776 of file c_chat.c. Definition at line 220 of file c_chat.c. References command_tell_all(), MSG_TYPE_COMMUNICATION_CHAT, and NDI_BLUE. Definition at line 974 of file c_chat.c. Definition at line 941 of file c_chat.c. Definition at line 64 of file c_chat.c. 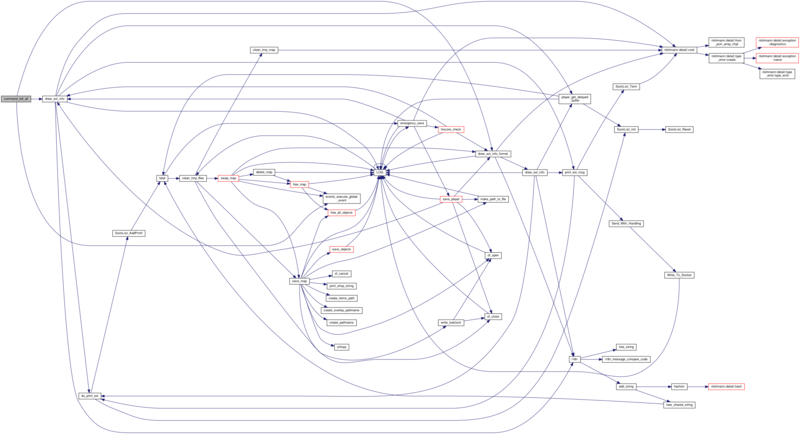 References draw_ext_info_format(), ext_info_map_except(), obj::map, MAX_BUF, MSG_TYPE_COMMUNICATION, MSG_TYPE_COMMUNICATION_RANDOM, obj::name, NDI_UNIQUE, NDI_WHITE, rndm(), and snprintf. Definition at line 985 of file c_chat.c. Definition at line 1293 of file c_chat.c. Definition at line 886 of file c_chat.c. Definition at line 732 of file c_chat.c. Private communication, by a DM (can't be ignored by player). op player trying to tell something to someone. params who to tell, and message. Definition at line 319 of file c_chat.c. Definition at line 996 of file c_chat.c. Definition at line 1007 of file c_chat.c. Definition at line 1018 of file c_chat.c. Definition at line 798 of file c_chat.c. Definition at line 1029 of file c_chat.c. Definition at line 919 of file c_chat.c. Definition at line 1040 of file c_chat.c. Definition at line 831 of file c_chat.c. Definition at line 1051 of file c_chat.c. Definition at line 875 of file c_chat.c. Definition at line 743 of file c_chat.c. Definition at line 787 of file c_chat.c. Definition at line 1062 of file c_chat.c. Definition at line 47 of file c_chat.c. References ext_info_map(), obj::map, MAX_BUF, MSG_TYPE_COMMUNICATION, MSG_TYPE_COMMUNICATION_ME, obj::name, NDI_BLUE, NDI_UNIQUE, and snprintf. Definition at line 721 of file c_chat.c. If there is an "dice" archetype in server arches, this command will require the player to have at least 4 dice to play. There is a 5% chance to lose one dice at each play. Dice can be made through alchemy (finding the recipe is left as an exercice to the player). Note that the check is on the name 'dice', so you can have multiple archetypes for that name, they'll be all taken into account. params string sent by the player. Ignored. Definition at line 107 of file c_chat.c. Definition at line 897 of file c_chat.c. Definition at line 1073 of file c_chat.c. Definition at line 820 of file c_chat.c. Must have been told something by someone first. Definition at line 335 of file c_chat.c. 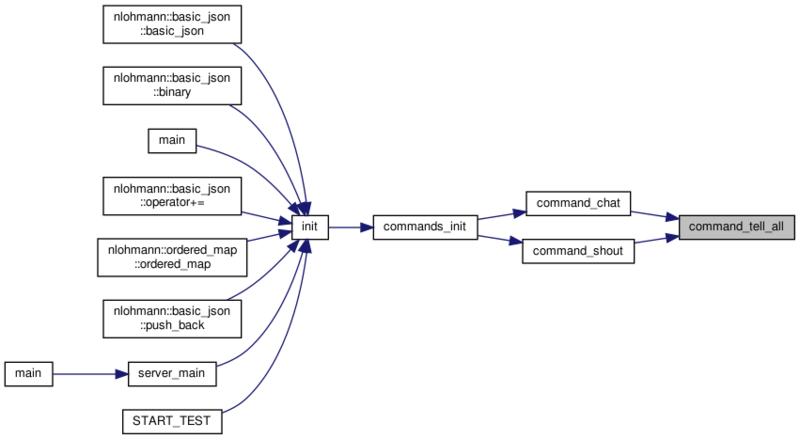 References obj::contr, draw_ext_info(), draw_ext_info_format(), find_player(), FLAG_WIZ, pl::hidden, pl::last_tell, MAX_NAME, MSG_TYPE_COMMAND, MSG_TYPE_COMMAND_ERROR, MSG_TYPE_COMMUNICATION, MSG_TYPE_COMMUNICATION_TELL, obj::name, NDI_ORANGE, NDI_UNIQUE, pl::ob, QUERY_FLAG, and safe_strncpy. Definition at line 34 of file c_chat.c. Definition at line 842 of file c_chat.c. Definition at line 809 of file c_chat.c. Definition at line 1084 of file c_chat.c. Definition at line 209 of file c_chat.c. References command_tell_all(), MSG_TYPE_COMMUNICATION_SHOUT, and NDI_RED. Definition at line 1095 of file c_chat.c. Definition at line 853 of file c_chat.c. Definition at line 1106 of file c_chat.c. Definition at line 765 of file c_chat.c. Definition at line 1117 of file c_chat.c. Definition at line 1128 of file c_chat.c. Definition at line 1139 of file c_chat.c. Definition at line 1150 of file c_chat.c. Definition at line 1161 of file c_chat.c. Definition at line 1172 of file c_chat.c. Definition at line 1183 of file c_chat.c. Definition at line 1194 of file c_chat.c. Definition at line 864 of file c_chat.c. Definition at line 307 of file c_chat.c. Utility function for chat or shout. desc 'chat' or 'shouts', will be appened after the player's name and before a :. Definition at line 181 of file c_chat.c. 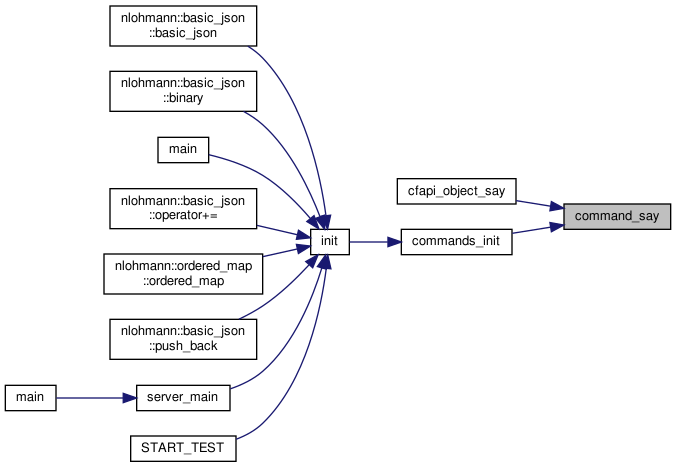 References obj::contr, draw_ext_info(), draw_ext_info_format(), EVENT_SHOUT, execute_global_event(), MSG_TYPE_COMMAND, MSG_TYPE_COMMAND_ERROR, MSG_TYPE_COMMUNICATION, obj::name, NDI_ALL, NDI_UNIQUE, and pl::no_shout. Referenced by command_chat(), and command_shout(). Definition at line 1205 of file c_chat.c. Definition at line 1304 of file c_chat.c. Definition at line 1216 of file c_chat.c. Definition at line 1227 of file c_chat.c. Definition at line 1238 of file c_chat.c. Definition at line 1249 of file c_chat.c. Definition at line 1260 of file c_chat.c. Actual function sending a private message. adjust_listen if non-zero, recipient can't ignore the message through 'listen' levels. Definition at line 234 of file c_chat.c. References draw_ext_info(), draw_ext_info_format(), EVENT_TELL, execute_global_event(), find_player_partial_name(), FLAG_WIZ, pl::hidden, pl::last_tell, pl::listening, MAX_BUF, MSG_TYPE_COMMAND, MSG_TYPE_COMMAND_ERROR, MSG_TYPE_COMMUNICATION, MSG_TYPE_COMMUNICATION_TELL, obj::name, archt::name, NDI_ORANGE, NDI_UNIQUE, pl::ob, QUERY_FLAG, and snprintf. 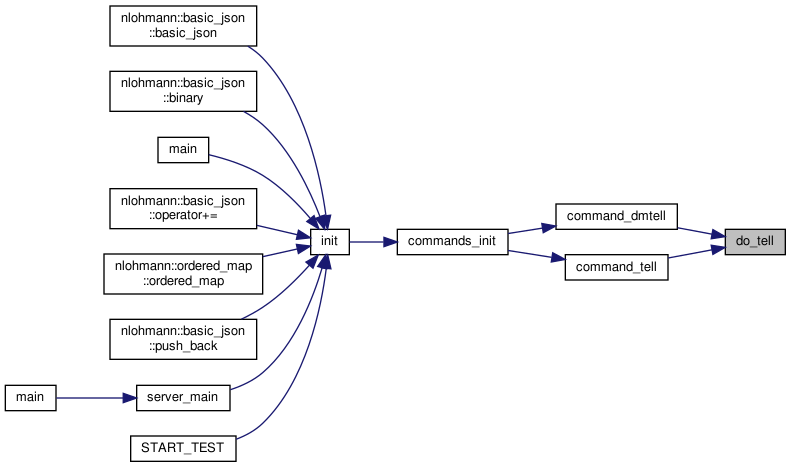 Referenced by command_dmtell(), and command_tell(). Results for the "orcknucle" game. Definition at line 80 of file c_chat.c. Emote texts when the player applies the emote to someone else. Three strings, first is sent to the player, second to the recipient, third to others. The first two must contain s (player's name), second must contain 2 s (player and victim's name). The emotes will be seeked at the index of their value minus 1. If an entry is NULL, then a default text will be used. Definition at line 570 of file c_chat.c. Emote texts when the player applies the emote to herself. Two strings, first is sent to the player, second to other players (must contain s). The emotes will be seeked at the index of their value minus 1. If an entry is NULL, then a default text will be used. Definition at line 506 of file c_chat.c. Emote texts when the player does not specify who to apply the emote. Two strings, first is sent to the player herself, second to other players (must contain s). The emotes will be seeked at the index of their value minus 1. If an entry is NULL, then a default text will be used. Definition at line 444 of file c_chat.c.